For a photographer, winter is far from an excuse to sit inside waiting until spring arrives. As much as I enjoy a cup of hot chocolate in front of a fire, I still enjoy capturing the world as a winter wonderland more. And who can forget the fact that this time of year is perfect for heading even further north to chase the northern lights? 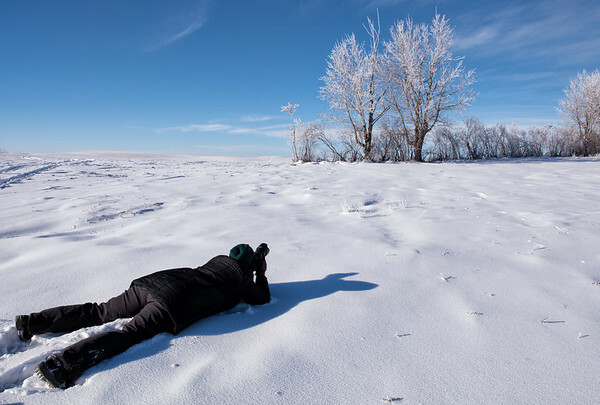 A workshop participant embracing the cold & snow during a photography workshop on Alberta’s prairies in November. With that endless sparkling snow comes a number of concerns though, namely, how do I keep my equipment safe in extreme cold? Even more importantly, how do I keep myself safe in extreme cold? Your camera is not designed to work in temperatures below zero. Canon and Nikon only rate their cameras down to that temperature; other manufacturers may have a slightly lower threshold, but not by much. You shouldn’t take this to mean that you can’t use your camera in these temperatures — I use mine constantly in temperatures hovering around -30ºC in winter with only a few small issues — but you may notice some sluggishness that isn’t usually there. My camera worked just fine on this -24ºC morning in Jasper, but I noticed that settings changes occasionally took longer than usual to register. 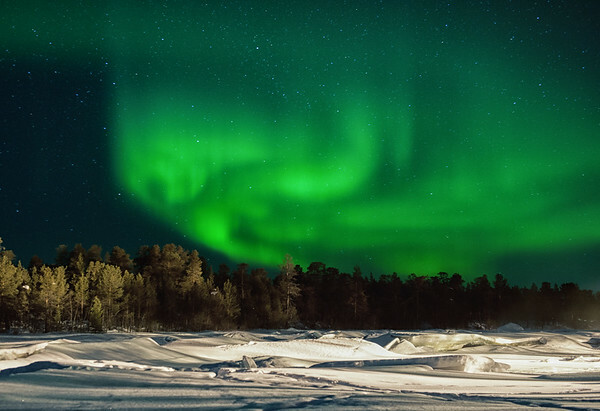 Your batteries will not hold their charge in cold temperatures (sometimes only firing 20-30 shots before the battery claims to be dead), and the last thing you want is to get outside under a fantastic northern lights show only to find your camera is dead. Notice that I said the battery “claims to be dead.” That’s because it hasn’t actually used up all its power; it has just been sapped by the cold temperatures. If you warm it back up, you’ll be able to get extra power out of it…and warming is actually easier than it seems. Simply put the battery into an inner pocket of your jacket (or one of your inner layers), and in 20 minutes or so, the battery will have more life available in it simply from the warmth of your body. It would be pretty depressing to wait until the sun lit up the steam rising off the lake only to find that your only battery had died from the cold! It’s best to start with all your spare batteries in an inner pocket to ensure none of them are starting from a cold state. Then, you can keep dying batteries in one pocket and fresh batteries in another (or, if you only have one pocket, write numbers on them in sharpie so you know which is which). You should make sure you take a number of spare batteries with you. I currently carry four spares; this may seem excessive, but if I’m outside for an extended period of time, I’ll go through 2-3 of them. You don’t necessarily have to make the investment to buy brand-name batteries either; I have three of the Nikon-brand EN-EL15 battery and two off-brand batteries purchased for less than half the brand-name battery price. They show very little difference in performance; the only difference is that the Nikon brand battery will still show you the number of photos you have left when the camera is off; when the off-brand battery dies, the display goes completely blank. 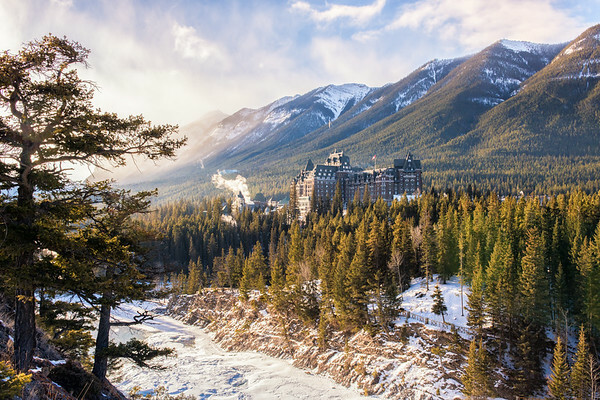 I captured this view of the Fairmont Banff Springs on a day of time-lapse shooting around the park. Had I not had multiple spare batteries, I wouldn’t have been able to shoot for the full day like I did. Finally, if you are driving to your shooting location and have an always-on power outlet in that car, you can use a car charger to keep your batteries going. I use the Hahnel cube, which charges two batteries at a time and can charge batteries for both of my Nikon cameras. Not only is your phone an incredibly handy tool for planning photo shoots, but it is also your lifeline to the outside world in case you need to call for help. So, it’s good to keep in mind that its battery can die just as quickly as your camera battery, and it often won’t give you much notice. When I was using an iPhone, my battery regularly would tell me 80-90% battery one minute and be completely dead the next. What was very annoying was that, even when warmed up, it wouldn’t turn on until I plugged it into a power source; at that point, it would boot up and tell me again that it was around 80% battery. 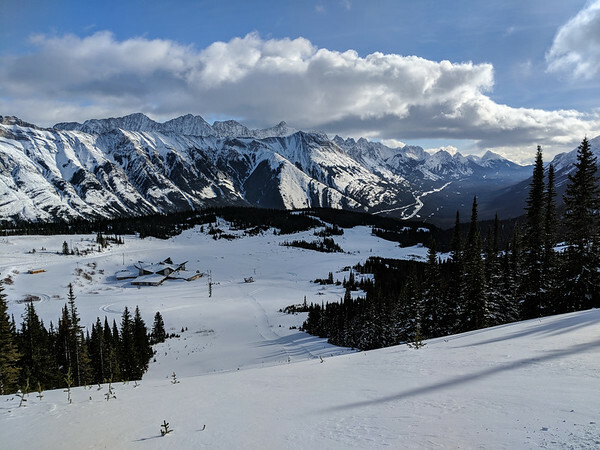 Plus, if your phone has battery power, it can help you capture some pretty nice photos too (like this one taken during an avalanche training day on Fortress Mountain. Luckily, my new Pixel 2 is a bit smarter than that; not only is it weather-sealed so it keeps the cold at bay a bit longer, but if it does shut down and is then re-warmed, it will turn on again without a connection to power. If you’re worried about your phone’s performance in the cold, it’s worth bringing along a spare battery that can give it a quick boost. I use an Anker PowerCore that can charge my phone fully 5-6 times before needing a recharge. It’s always a good idea to carry your gear in a bag while out on cold days. Not only will it keep it slightly warmer, but it will also keep snow from getting into little nooks and crannies (like your hotshoe) while you carry it on your shoulder. 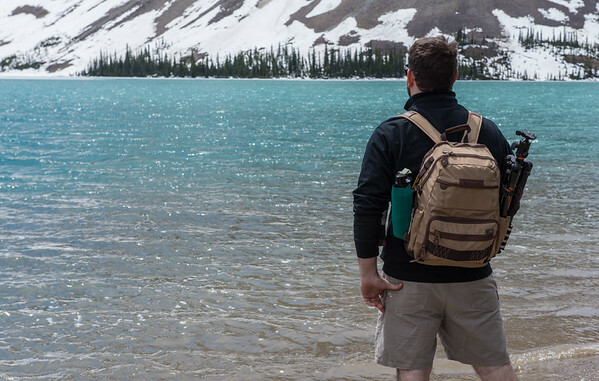 The Vanguard Havana backpack (and Bow Lake). I recommend a backpack designed to carry cameras that has extra cushioning around them as well. That means that your camera will be much more protected if you happen to slip and fall on ice. I know this from personal experience, having fallen on black ice last year while carrying my camera in a standard hiking backpack; the camera body was cracked in half as a result and cost a cool $700 to repair. The sub-$100 price of a Vanguard Havana backpack is small change in comparison. You should also make sure that you bring along any lens hoods that you may have for your lenses. Not only will a lens hood help block any stray reflected light (which there is a lot more of when everything is covered with bright white snow), but it will also provide added protection from drifting snowflakes. Some snowflakes will inevitably still get on your lens, but you’ll have to clean it a lot less with a lens hood on (or, alternatively, you’ll have to do a lot less cloning out of snowflake blobs after the fact)! Yes, breathing can be difficult enough when the air is cold and dry, so you may already be considering this already. However, it’s important to remember that your breath — nice, warm, humid air — can cause serious issues with your camera gear. It’s not just your lens that is vulnerable to humid air, either. I breathed on this tripod head in -18º and the humid air froze the locking mechanism, stopping me from removing my camera from the tripod for hours. For instance, if you go to check for spots on the lens and accidentally breathe on it, you’ll find yourself with a nice layer of photo-blurring frost. Trying to wipe this frost away could leave permanent scratches on the lens, and as mentioned in the section below, defrosting it inside could take half an hour or longer. 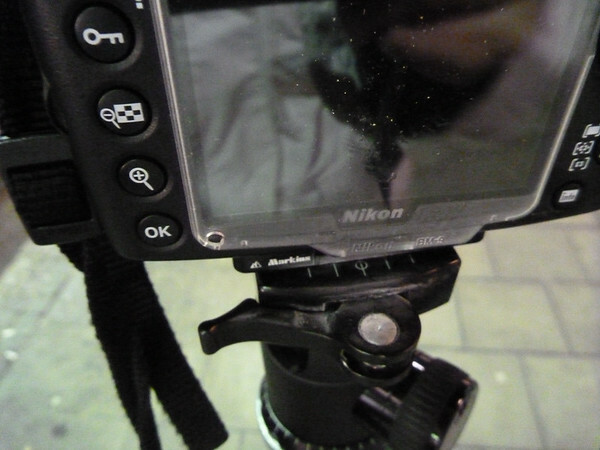 The same issue can occur on your viewfinder or even your LCD as well. To avoid this, you can wear a face-covering scarf or neck gaiter that will funnel your breath upwards. Just watch out if you wear glasses as this will just move the issue to them instead! One last — and very important — thing to remember about camera care in the cold is how you manage the transition between the cold outside and the warm temperatures inside a car or building. After you’ve been outside for any period of time in extreme cold, the camera body (and particularly metal lenses) will be very cold. If you introduce them directly to a heated room or vehicle, condensation could form inside the camera body or lens. Not only will this be an irritation if you realise there is something else you want to shoot, only to find that your lens is fogged from the inside, but it could also cause harm to the internals of the camera. This goes for staying in glass igloos as well. If you want to shoot scenes from inside, shoot them prior to going outside otherwise you will risk condensation in your camera. To avoid this, you should seal your camera in a ziploc bag and leave it there for at least half an hour after going inside. This lets the condensation form on the bag rather than inside your camera. 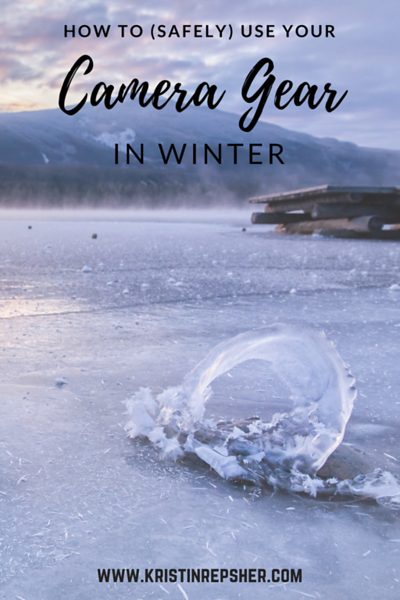 If you want to look at your photos before that, you should remove the memory card before sealing the bag (just be careful handling a small memory card while wearing gloves — you wouldn’t want it to end up dropped in the snow!). You’ll probably find that, in general, everything is just a bit more difficult when it’s below zero, particularly when you are using a device with lots of little tiny buttons and dials. To begin with, it’s worth practicing using your camera with gloves on. You’ll need to get used to fumbling with dials with the least dextrous hands possible, so if you’ve at least practiced while your fingers aren’t slowly losing feeling, you’ll know where the particular pain points for your camera are (on my Nikon Df, for instance, it’s trying to change the ISO, which requires pressing a tiny button and moving a manual knob). It’s better to know how to use your camera with gloves on before you are sitting in snow in -20ºC. Thanks to my friend Michelle for the photo. I will talk more about specific cold weather clothing recommendations in an upcoming post, but it’s important to mention gloves here as well. I recommend that you wear a thinner glove (like a glove liner) inside a thick pair of mittens so, if you get desperate and just can’t get the ISO or some other setting changed, you can take off your outer layer without risking exposing your hands directly to the cold. Hand warmers (available in outdoor stores and many general grocery stores in cold regions) placed in your mittens will warm up your hands much more quickly once you put them back on again. 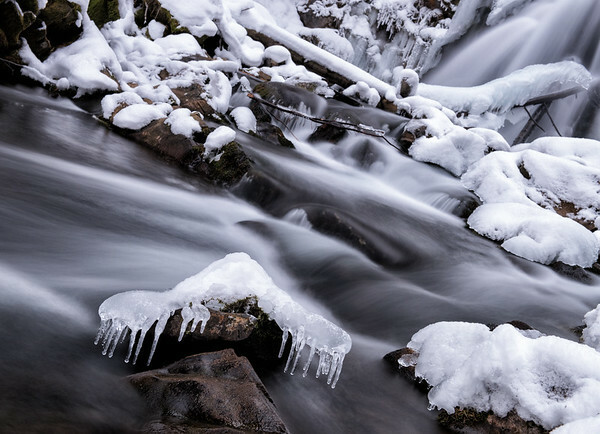 If you are planning to shoot any long exposures (or do any shooting at night), it’s important that you know how to operate your tripod in the cold. You should practice extending and shortening the tripod’s legs with your gloves on at home; the last thing you want to have to do is remove your gloves and touch cold metal when it’s -20ºC outside. A tripod is useful for shooting long exposures like this one, captured at Fairy Creek Falls in Fernie, BC. If you have a tripod where you have to rotate the closure rather than closing a clip, make sure you can rotate it into locked position with gloves on. It’s hard to tell when these have stopped turning because you have an awkward grip with gloves on and because they are actually locked tight, and you don’t want your tripod collapsing underneath you when you thought it was sturdy. If you are shooting in snow, you should check that your tripod is not in loose snow. If the snow below the tripod has not compacted fully, you risk the snow gradually moving during your photo and introducing blur to your shots. To avoid this, you should either (a) push your tripod as deep as possible in the snow, or (b) find a way to help the tripod “float” on top of the snow. Frisbees or coasters will help keep your tripod higher in the snow. Alternatively, you can buy powder baskets for ski poles and screw them into the bottom of your tripod to give it more floatation. 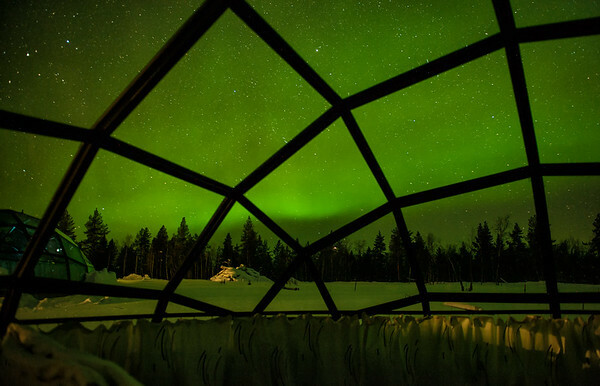 If you want to capture the northern lights, you will have to use a tripod. 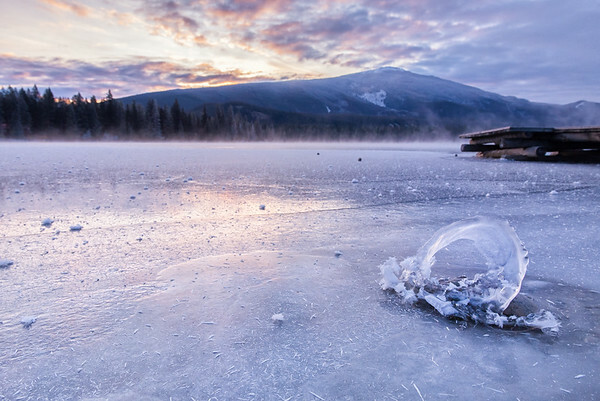 Finally, if you are shooting on ice (for instance, capturing Abraham Lake’s famous ice bubbles), try to take a tripod that has spikes in the feet. These spikes will help you solidly anchor your tripod on the ice so it doesn’t go skating away from you as soon as a gust of wind blows. I know that cold doesn’t always equal snow, but they usually go hand-in-hand (and really, winter scenes are much prettier with that layer of snow on them). There are two important settings that you may have to tweak so your winter scenes come out as planned. If you shoot on any semi-automatic mode (for instance, aperture priority or shutter priority), your camera will be metering the scene and choosing settings accordingly. When a scene is covered in bright white snow, the camera has a tendency to underexpose the scene and turn that sparkly white snow into a dull grey. To avoid this, use exposure compensation to overexpose your photo (starting with about 2/3 of a stop). This should brighten the overall scene, but you’ll want to watch your highlights (the brightest areas of the photo) to ensure they haven’t blown out and lost all detail in the process. 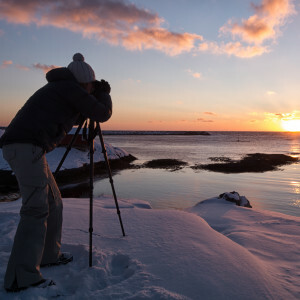 Avoiding underexposure in winter photos can take your images from dull and gray to bright and white. Alternatively, if your camera has way overexposed the scene (losing all the details in the snow in the process), use exposure compensation to underexpose the photo and regain the details in those areas. Snow has a tendency to turn blue in photos, particularly if it is in the shade, and particularly if you are using auto white balance. If you are shooting RAW, this is an issue that can be fixed easily in post-processing, but if you are shooting JPG, you’ll want to fix this while you are shooting to ensure the best possible colour. To fix this, change your white balance to daylight, cloudy or shade; these are in order of amount of yellow added, so daylight will add the least yellow to the scene while shade will add the most. 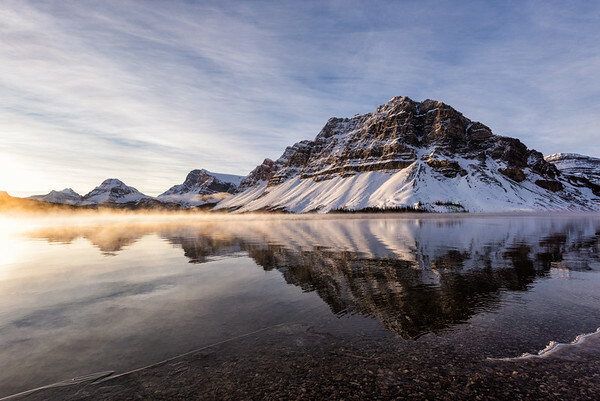 While winter can definitely present some challenges to photographers — particularly those used to shooting in much warmer climes — it is an absolutely magical time of year to shoot, and many of the issues that occur with your gear can be easily mitigated if you’re prepared. So bundle up, and happy shooting!